American troops, including African American soldiers from the Headquarters and Service Company of the 183rd Engineer Combat Battalion, 8th Corps, US 3rd Army, view corpses stacked behind the crematorium during an inspection tour of the Buchenwald concentration camp. Among those pictured is Leon Bass (the soldier third from left). 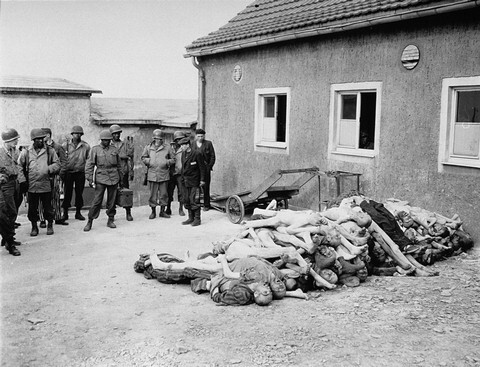 Buchenwald, Germany, April 17, 1945.